A cochlear implant is an electronic device that restores partial to substantial hearing to the deaf and hard of hearing. It is surgically implanted in the inner ear and activated by a device worn outside the ear. Unlike a hearing aid, it does not make sound louder or clearer. 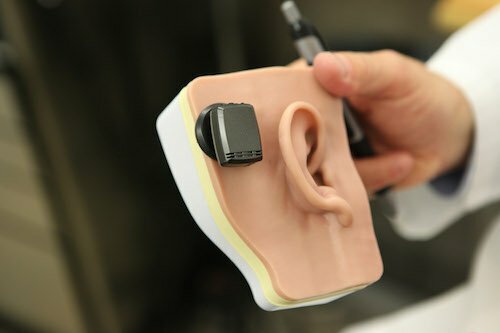 Instead, the device bypasses the damaged cochlea (inner ear) and directly stimulates the nerve of hearing, allowing individuals who are severely to profoundly hearing impaired to receive sound. 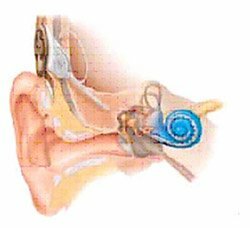 Sensorineural (‘nerve’) hearing loss can usually be ameliorated with hearing aid usage. When the hearing loss is so severe that hearing aids are not adequate, cochlear implant surgery is an excellent option. 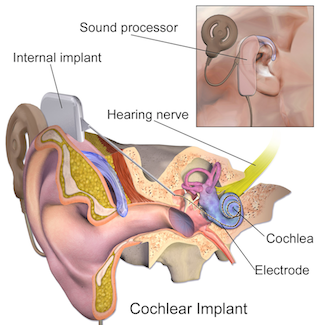 Cochlear implants convert speech and environmental sounds into electrical signals, bypass damaged hair cells in the inner ear, and send these signals to the hearing nerve. The implant consists of a small electronic device, which is surgically implanted under the skin behind the ear and an external speech processor and microphone, which are worn behind the ear. The microphone picks up sound and the speech processor translates it into distictive electrical signals. These ‘codes’ are transmitted across the skin to the implanted electrodes in the cochlea. The electrodes’ signals stimulate the auditory nerve fibers to send information to the brain where it is interpreted as meaningful sound. Who is a Cochlear Implant Candidate? Implants are designed for individuals who cannot attain adequate benefit from a hearing aid. They must be 12 months of age or older. There is no upward age limit for cochlear implantation. Bilateral implantation (both ears) is now approved by the FDA as a safe and effective method of hearing restoration. For further guidelines and measurement please read our cochlear implant candidacy guide. A cochlear implant evaluation assesses whether the patient is an appropriate candidate for this surgery or not. It is done by an implant team consisting of your otology surgeon, a cochlear implant audiologist, a radiologist, and, as needed, a social worker, a psychologist or psychiatrist, and/or an education specialist, who will give you a series of tests. These include hearing tests, CT scans, and other tests as indicated. To learn more please read out in depth article about cochlear implant candidacy. Implant surgery is performed under general anesthesia and lasts from two to three hours. An incision is made behind the ear to open the mastoid bone leading to the middle ear. The procedure may be done as an outpatient, or may (rarely) require an overnight stay in the hospital. Your doctor will discuss the details of the surgery with you. About one month after surgery, your team places the signal processor, microphone, and implant transmitter outside your ear and adjusts them. This is the first time that you will hear after the surgery. They teach you how to look after the system and how to listen to sound through the implant. Some implants take longer to fit and require more training. Your team will probably ask you to come back to the clinic for regular checkups and readjustment of the speech processor as needed. Cochlear implants benefits vary from one individual to another. Nearly all users find that cochlear implants help them communicate better through improved lipreading, and well over half are able to discriminate speech without the use of visual cues. Many implant users are able to use the telephone effectively. The earlier a child with congenital (from birth) nerve hearing loss is implanted, the more complete and timely will be their speech and language acquisition. For adult implant recipients, shorter duration of deafness is very important for better early implant outcome. Your team will explain what you can reasonably expect. Before deciding whether your implant is working well, you need to understand clearly how much time you must commit. A very few patients will not benefit from their implant. The U.S. Food and Drug Administration (FDA) regulates cochlear implant devices for both adults and children. Because implantation has been proven to be effective and safe since its first approval for adults in the mid 1980’s, the FDA has expanded criteria and now approves unilateral (one-sided) and bilateral (both sides) cochlear implantation in adults and children as young as age 12 months. The total cost of a cochlear implant including evaluation, surgery, the device, and rehabilitation is around $75,000. Because this is not a hearing aid and because it is FDA-approved for hearing restoration, most insurance companies provide benefits that cover the cost. Before you undergo surgery, our office will obtain the insurance precertification that is necessary to ensure that your health insurance company will cover these costs. If you believe you or your family member is a candidate for cochlear implantation surgery, please make an appointment for an audiogram (hearing test) and to see Dr. Kohan in consultation. If you wear hearing aids, please get the hearing test done both with and without your hearing aids in place. If the initial evaluation determines that you are probably a candidate for this operation, then we will arrange for you to be seen by one of the cochlear implant audiologists at the New York Eye and Ear Infirmary/Beth Israel Medical Center Cochlear Implant Center, and to have a CT scan of your inner ears. You will receive brochures and other information regarding the types of implants available and your options will be discussed in detail. As always, we aim to provide you with compassionate, comprehensive, and state-of-the-art hearing health care. If you have any questions about Cochlear Implantation Surgery and treatment, please feel free to call Dr. Kohan’s office for an appointment (212) 472-1300.